Tuesday November 8, 2011 was election day and it marked a new era in voting in Oregon. 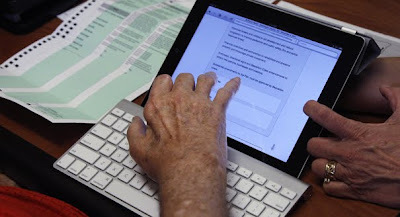 It was the first time that voters could use an Apple iPad to select candidates. The iPad voting test was done in a special primary election not a state wide or district wide, the focus was on a very select group of people in 5 counties. The voting process on the iPad went very well and smooth, 89 voters used the new iPad voting machine to mark their ballots. There were no problems recorded and the voters that used it thought it was wonderful and many look forward to using it again in the next elections. To elimate any fraud or vote rigging a paper trail was put in place, when the voter used the iPad to mark their ballot a signal would be sent to a printer which would create a papertrail for the vote. This platform will soon be adopted by many states and countries as it elminates alot of hardware and cuts costs.